I have Done this to know that the Redhat Linux, KVM will supports the multiple operating systems as a virtual guest including the windows OS.So I have planned to do myself on my machine and Its working Fine. KVM does not support Vmware workstation that is hosted Redhat Linux, About this I'll explain it on my another Blog. So Now, I suggest You To install directly on the Redhat Linux on your Host Machine hardware for supporting KVM to work. To Configure this KVM that the purpose of setup "Virtual Machine Manager" In Linux Machine For Creating Instances In Eucalyptus. Step:1 Before setup this KVM, be ensure Yourself that you need YUM (Yellowdog Updater Modified) repository to install upporting KVM Packages, Since it have lot of Dependencies. YUM:- It was open source tool for rpm package management for all Linux Machine. Make sure you should LogIn as Root. Step:3 Now You start installing the YUM packages and after Every command successful statement end with "complete!" Step:5 Install another important packages are "Libvirt" and "Libvirt-Phython" for API Libraries of necessary Files. Step:6 Now another Important Tool and our ultimate Goal here is to setup "Virtual Machine Manager" ie.., For support the "virt-manager" to manage the virtual Machine. 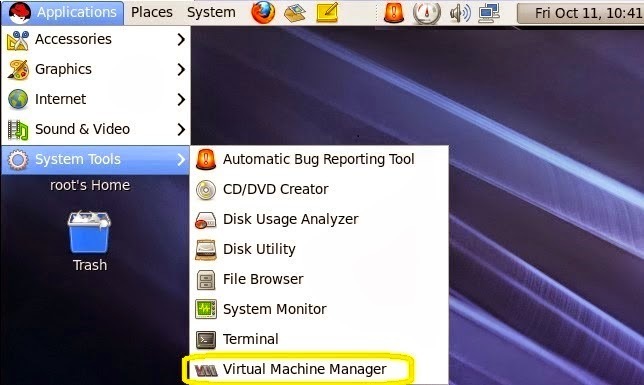 Step:7 To open the "Virtual Machine Manager", From Your Linux Machine Desktop open the Application--> System tools--> Virtual Machine Manager to start Using. Step:8 Now using this tool You can create New Virtual Machine and manage it by using this virt-manager Tool. If you feel difficult to install above things Don't Worry I will help you to setup by Single command Line to finish the Virtual Machine Manager. Please give us a THUMBS UP if you like My Exposing!! !..